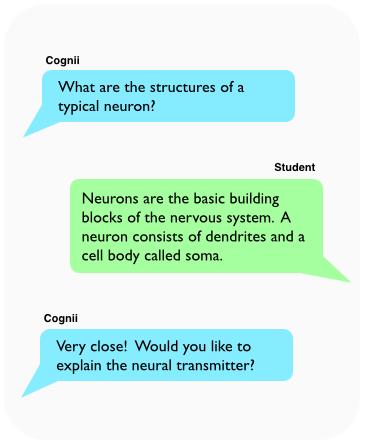 Cognii's Conversational EdTech enables the best pedagogical practices known to learning science. Virtual assistants and chat bots such as Siri, Alexa, Cortana and Google Assistant are an increasingly familiar products, simulating human to human interaction with the use of Artificial Intelligence. But these are general purpose assistants, used for consumer activities such as asking "What's the weather like?". Cognii Virtual Learning Assistant is the only virtual assistant that is designed and optimized for educational conversation. Cognii VLA is a type of an intelligent tutoring system that engages learners in a real time, one to one coaching conversation, helping them revise their answers. Unlike other tutoring systems, Cognii VLA uses learners' own natural language, not their selections in multiple choice items, as the basis for assessment. Because open response questions are more accurate than multiple choice questions in assessing deep understanding and critical thinking, Cognii VLA can provide better coaching than earlier systems. 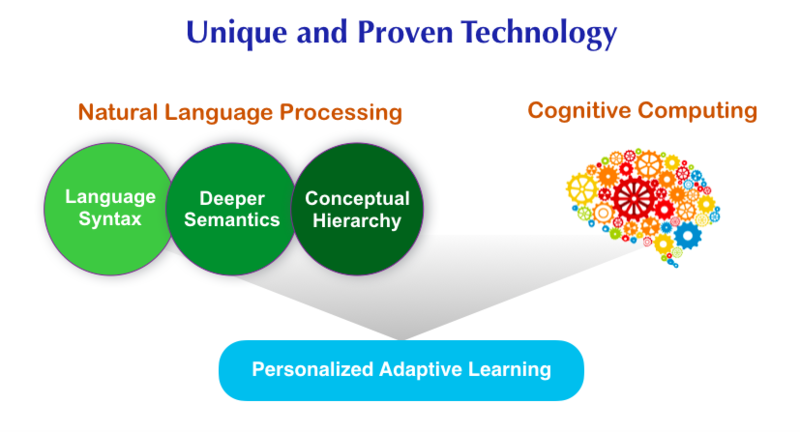 Using Cognii’s proprietary Natural Language Processing algorithms, Cognii Assessment Platform analyzes the syntax, the deeper semantics, and the hierarchical structure in learners' written answers to open ended questions. Cognii can not only assess the level of correctness of a learners' answer, but also pinpoint the specific ideas in what the learner has written. How words are ordered and combined to create phrases, sentences, and paragraphs. The meaning of the words, phrases, and sentences in the context of the question. What semantic concepts are present and absent in the student answer. Cognii’s ability to evaluate writing is highly accurate. In a controlled research study, Cognii’s assessment was found to be 96% as accurate as humans in evaluating short essays. Cognii uses data mining and machine learning to ensure that the scoring and feedback become more accurate over time. Cognii’s technology is fundamentally different from other essay scoring software. Typically, those programs have been used for summative assessment providing only a score, not feedback and evaluate only the structure and style of writing, not the ideas. Cognii VLA is optimized to engage students in a meaningful formative assessment based conversational experience focused on ideas. Students get real time feedback on what they've written and make multiple attempts to the point of mastery. Cognii's Virtual Learning Assistant uses powerful natural language processing technology to provide instant assessment of students' open-response answers, along with qualitative feedback. It acts as "Siri for Education" by engaging students in adaptive tutoring conversations and helping them master concepts and solve problems. Cognii supports inquiry-based learning and facilitates implementation of Common Core and Next Generation Science standards. Students can learn any topic, anytime, anywhere with the help of Cognii's interactive formative assessment.